Today's post is all about resourcefulness and ingenuity. Two words that make me utterly happy. Knowing this about me, my sweet friend Kathrin crafted this beautiful pincushion. She's letting me share its secret with you! Coffee grinds! It's filled with dry, used coffee grinds!! They keep your pins and needles rust free. Who knew? Certainly not me. This might not be a new concept to some of you... I've since discovered it has a long history. Maybe your grandmother or even great grandmother saved the morning grinds for just this purpose. My little cushion was lovingly stitched by hand. It has a nice, solid weight and the smell is divine. Dried grinds have a rich, but delicate, aroma that's quite intoxicating to a coffee lover. A perfect gift! My pins are so happy! Kathrin, of course, thought of my coffeesack pincushions. So, I've stopped tossing my grinds into the compost, as I formulate a plan for keeping them tucked into the loose weave of burlap. Perhaps a slipcover... hmm. In the meantime, thank you so much Kathrin... and when she's ready (no hurry, K.) I'll be sharing more. Kathrin does amazing hand-work with vintage textiles. You're going to love it! An on another note: Sam, from Inklore, has a wonderful series running on printers and their source for inspiration. Please visit me over there today for a little behind the scenes on what inspires some of my carved images. Thanks, so much for including me, Sam!! What a wonderful and fragrant way to keep track of one's pins. BTW, I don't think I've ever had rusty pins. Perhaps mine are stainless? That's a splendid idea! I would have never ever thought to do that. I am very new to sewing and I was having a small rust problem so this is great! Thanks to Kathrin for letting us in on the secret. I had heard of using crushed walnut shells, but didn’t know where to get them. Used coffee grounds, on the other hand, I have. Just to be clear you are using them after they have gone through a regular coffee pot? I would think that it would mold? 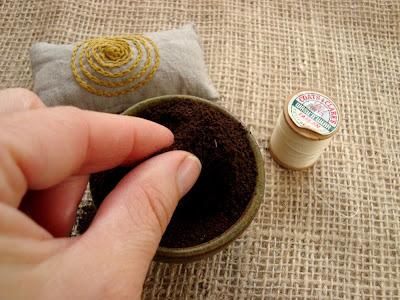 i always put my coffee grinds in the compost because they are so good for the garden but I will now save some to dry and use in a pin cushion or two. The aroma should help when I am sewing late into the night. yes, to clarify: after you have used your grinds for coffee, dry them. I dumped mine into a bucket and they dried over night! That is so cool! I can't believe I've never heard of it. I'll definitely be trying this out. Thanks for the tip! Who knew that coffee grinds keep pins rust free? I love these little tidbits of wisdom that float around and get passed on. And that pin cushion must smell heavenly! Oh, wow, that's both useful and funny to know. I love re-using and repurposeing things as well - and coffee is essential!! So this is definitely next on my to-do list. Usually I spread my used coffee grinds in my flower beds in the garden. Flowers also loves coffee! who ever would have guessed? that is so bizarre! have to try it though because it just sounds too cool. 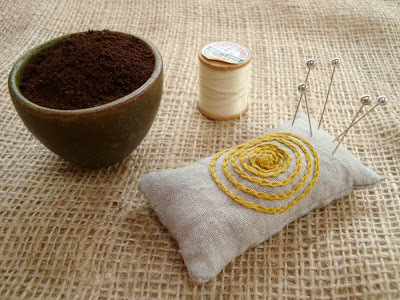 I love the coffee grind pincushion idea! That is very resourceful, as you mentioned. I'll have to give this a try... And, as always your creations look beautiful! Coffee grounds? Who would have thought? Great idea. I'll be linking to this on my blog tomorrow. Thanks!